Role-play an arena duel between Thor and Hulk and then team up with these two old friends to topple Grandmaster with this LEGO Marvel Super Heroes Thor vs. Hulk: Arena Clash 76088 Set. 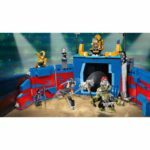 This awesome LEGO Marvel Super Heroes Thor vs. Hulk: Arena Clash set features an arena with a sliding gate, secret weapons rack, 2 toppling pillars, smash- function wall and an opening prison cell. Use Thor’s super jumper to knock Grandmaster off his throne and Loki off his seat. Danger! Hela is gathering her Berserkers and the mighty Fenris wolf to attack Asgard. 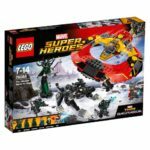 Jump into the cockpit of the Commodore with Valkyrie and launch into the sky with this LEGO Marvel Super Heroes The Ultimate Battle for Asgard 76084 Set. Fire the dual stud shooters and drop Bruce Banner into battle! Dodge Fenris’ huge paws and the Berserkers’ blades. Team up with Thor in a Power Blast shootout against Hela. This is the ultimate battle—can you defeat the enemy and make Asgard safe again? Fight for the future of Asgard!